Gion, a town in Kyoto shows the historical Japanese townscape. It is a very popular sightseeing spot, and many foreign travelers enjoy walking the street of Gion and watching the traditional Japanese dancers called “Maiko” walking along the street. There is nowhere similar to this nostalgic town, so if you ever come to Kyoto, it is a must to go there. The town of Gion started around the Edo period in Japan. In Kyoto, there were many shrines and temples such as the Yasaka Shrine which is popular even now. Many tea-houses (café in nowadays) called “Chaya” opened around Gion, and it became a famous spot to rest and enjoy tea after visiting the shrines and temples. During the night time, the Chayas would change in to a bar or a night club, as you may say these days, and many beautiful young women were to work as dancers and waitresses. The shops would compete against each other for which shop has the most beautiful ladies, and as a result Gion became a famous entertainment district in Kyoto. As the time changed from Edo to Meiji period, many technologies were introduced and Gion changed as well. Now, the northern part of Gion is illuminated by the glittering neon lights and has become modernized. 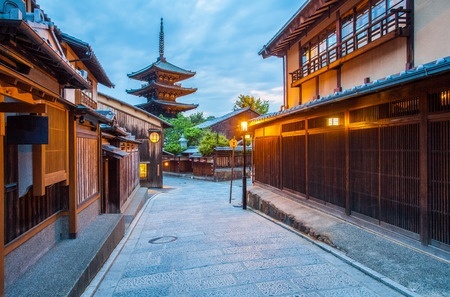 However, in other parts people have decided to remain the traditional townscape of Gion during the Edo period to enjoy the historical scenery, and to preserve the old traditional architectures of the Chaya and restaurants. You cannot express Gion without mentioning about “Maiko”. Maiko is a name for young girls who are training themselves to become a full fledged performer for dancing and playing the Shamisen, a Japanese traditional instrument which is similar to a guitar. A full fledge performer is known as “Geiko”, and all the young Maiko girls train very hard from a young age to become one. Because of the unique costumes and make-up, there are services which travelers can wear the clothing and make-up and disguise as a Maiko. You may see many people who look like a Maiko in Gion, but the majority of them are not real Maiko, for real ones train themselves during the daytime, and show their techniques during the night time at the Chaya. 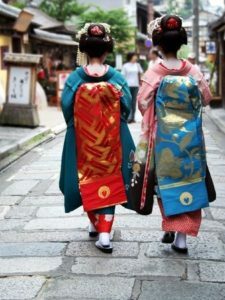 In order to meet a real Maiko, you have to go to the Chaya or restaurants, but many Chaya in Kyoto refuse first-time customers, saying that customers without introduction from another regular customer are not allowed to enter. For travelers to meet a real Maiko or Geiko, the only chance will be around the night time when they go to the Chaya for their job, which is a very rare chance. If you meet a Maiko or a Geiko by any chance, please note that they are on their way to work. These days many travelers ask them for a picture, or take a picture without their permission, which is being regarded as a problem. Kyoto City publicizes not to go close to them or to stop them without a necessary purpose. There are many traditional architectures in Gion, and it is a very popular sightseeing spot. Among the many fabulous architectures, the Yasaka Shrine may be the most famous one. Yasaka Shrine is said to be the start of the town of Gion itself, and for several hundreds of years ago, it has been a popular spot for the worship visitors. Even now, over a million visitors come during the New Year holidays. Also, there is the famous Shijo O-hashi, a bridge made of copper which is built over Kamogawa river. This bridge has been destroyed many times because of countless flood damages. The first bridge was built around the Heian era, and because this bridge was the main route for transporting goods and resources, it was rebuilt each time it was destroyed. The bridge which we see now was built in 1942, and it is now the main transportation route for people to go to Gion. Another sightseeing spot is the weeping cherry tree at Maruyama Park. Although you may see it only during the spring, the cherry blossom tree shows a magnificent scenery which you can see it only in Japan. Maruyama Park is next to Yasaka Shrine, so many people visit both the Yasaka Shrine and Maruyama Park and enjoy the day. A must-see event in Kyoto is the Gion-Sai (meaning “Gion Festival”). The festival is held from July 1st and throughout the month, and it is known very well as Kyoto’s summer tradition. During the festival month there are many events taking place, such as the “Mikoshi-Arai” which people purify the Mikoshi (a portable shrine) with the water of Kamogawa river. There is also the event of “Yamaboko Jungyou” which people pull the festival float called the “Yamaboko” and walk around the town of Gion. Yamaboko Jungyou is especially very famous, and people enjoy the fabulous designs of the Yamaboko. Many traveler aim for this season to see and enjoy the festival, and the whole town of Kyoto is full of people from Kyoto and from other parts of Japan, and also from overseas. Gion, and Kyoto is a very fascinating place where you can feel the history and the tradition very closely. However, there are many unique cultures which travelers may find it troublesome. You may want to check on those original rules before departure, for you might not be able to enjoy your trip if you are not familiar with the rules. We can assure you that you will be deeply touched by the splendid scenery and wonderful culture of Kyoto, which is one of a kind.